Last week, we had our first Triple-S research seminar, discussing the first findings from the assessments of service provision around point sources in Ghana and Uganda. Although I had seen a sneak preview of some of the data, the consolidated results were shocking. After seeing them, I was tempted to declare community-based management (particularly of point sources) to be dead. One of the key premises behind community-based management is that users pay for the operation and maintenance costs. On this blog we have reported at various occasions about the non-payment of major repairs. But some of the data presented this week, show that even payment of minor O&M costs is shockingly low. The colleagues who did the study in Uganda, found that barely any of the respondents in 8 districts pays a regular fee, though many do pay a contribution whenever a repair is needed. These contributions are so small that they often do not cover the minor O&M costs. Or, it takes time to collect the money to carry out repairs, with long down-time as a result. The colleagues also found that in 6 out of the 8 district, less than 50% of the water points was reliable (i.e. water points for which the last break-down lasted less than 2 weeks). The other myth, which was already busted by RWSN, is that people demand a good water service. Various of the findings show that this demand is only partial. 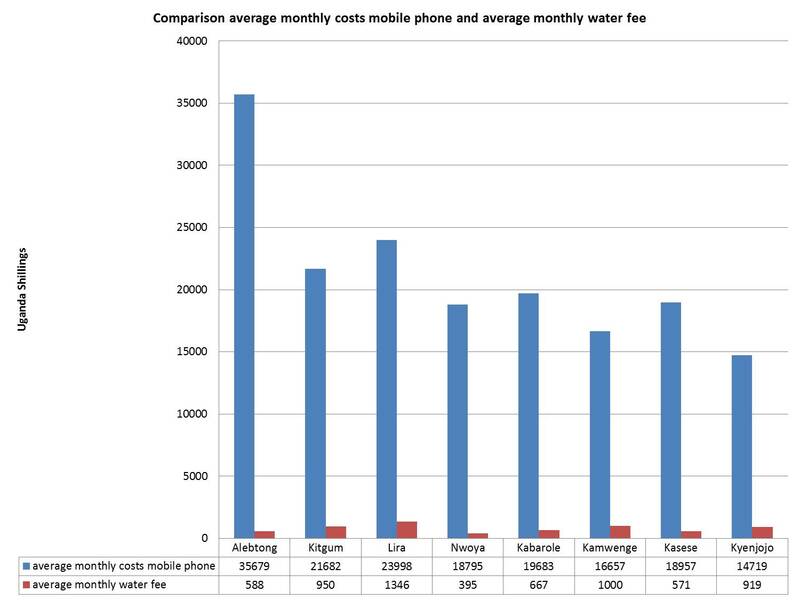 If demand is understood in the form of a certain level of willingness to pay for a service, it suffices to compare the data on spending on water fee and on mobile phones, as in the graph below. This shows that there is ability and willingness to pay for mobile phones, and given the relatively low costs of water, there should also be an ability to pay for water. However, given that actual spending on water is so low, willingness to pay may be very low. The low level of demand can also be seen by comparing water use patterns in terms of quantity, between the wetter and drier districts in which the Uganda study was done. In the wetter districts, where there are many alternative sources, average water use from improved sources was around 10 lpcd. In the drier Northern districts where there are fewer alternative sources of water, people used on average 20 lpcd from improved sources. If people have the choice and possibility to use water from unimproved sources – which are for free – they do so; though let’s hope at least they use the 10 lpcd from improved sources for drinking and cooking, and the unimproved sources for uses that do not require high quality like cleaning. The fact that people only use their improved sources to the bare minimum reflects probably their relatively low demand for water services and may explain their limited willingness to pay for them. And at such low levels of water use, the amount of revenue generated will be low as well, particularly under pay-as-you-fetch schemes. From a service management perspective, a certain minimum level of revenue is needed to cover some fixed costs of maintaining the service. As two of the key premises behind community-based management do not seem to hold, what does this mean for community-based management? Should more effort be put into making it work, e.g. by doing more demand creation, or retraining water user committees over and over again on the importance of fee collection? There is a risk that many analyses of community-based management remain in single-loop learning, where the focus is on tinkering with elements of it, without questioning the underlying assumptions. Or, should we actually move to double-loop learning, and drawing our conclusions on the mounting evidence that many underlying assumptions do not hold, and the myths that were so eloquently busted by RWSN. My sense is that, we need to move towards the double loop, particularly around point sources. Around more complex piped schemes that provide higher levels of service, it is possible to put some of the basics around community-based management in place – with all its imperfections, it somehow works. But, around point sources, the basis is simply too weak. The question then is what should be done about it. The answer is found in some de facto practices. An interesting initiative in Uganda are the hand-pump mechanic associations (HPMAs), which are hired by the district to carry out major repairs. The costs of these are shared between districts and communities. In this way, at least one of the financial arguments against community-based management can be addressed. But, it does mean a de facto shift towards mixed management with a clearer role and financial contribution from districts and communities. Moreover, it allows for the economies of scale and security of funding for the hand-pump mechanics, which seems to have been one of those intractable problems in the water sector for a long time. Probably, there are other modalities as well, in which local government assumes a bigger part of the responsibilities under mixed management arrangements. It is easy to declare community-based management dead, but the challenge is in finding the right mix of incremental improvements and more radical measures away towards a meaningful mixed management, that works. Did the Ghana study look at education of the communities regarding water? I’m just thinking that low demand and use of improved sources could be a result of people not being educated on the benefits of using these improved sources.